Since monitoring air quality is a notoriously non-trivial problem, a wide variety of techniques have been employed. The goal of using a scientific tool to perform simultaneous identification and quantification of important atmospheric components has been elusive. Of the techniques available, only mass spectrometry and Fourier transform infrared (FTIR) spectrometry have demonstrated this dual capability. FTIR is by far simpler and more sensitive, achieving ppb level detection limits with only one moving part: the scanning mirror. No recalibrations or consumables are necessary. Routine maintenance is a snap. It involves changing a HeNe laser and IR source every two years. Use of a Stirling detector eliminates the requirement for liquid nitrogen in the field. MIDAC air monitoring spectrometers are particularly rugged and reliable. They have been used for 30 years worldwide to measure chemical releases of all kinds: from explosive vapors, to pollutants, hazardous materials, and volcanic emissions. Equipped with cutting edge software they are capable of determining more than 25 compounds simultaneously in near real time. The instruments are functioning 24/7 from the Antarctic to the tropics. A recent installation occurred at a mineral processing plant in northern Mexico. 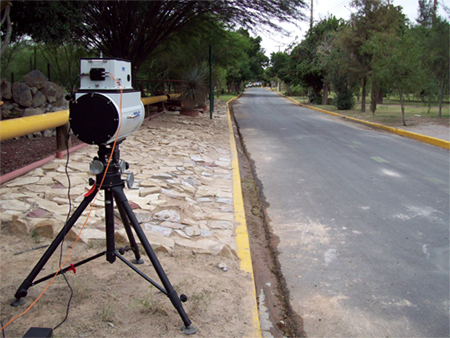 Having been issued a government mandate to monitor its emission of sulfur dioxide , the company chose a MIDAC FTIR. Within one week from the beginning of the installation, the environmental wing of the plant was able to measure SO2 accurately. The staff was also surprised at the ease with which they were able to identify and quantify other components of the emissions and so perform proactively to prevent further legislative difficulties. Support from MIDAC scientists developing the application, configuring the system, and then installing it and training in its use was key to the success of the project.